It looks like the world of home security and automation has become a wee bit smarter, never mind the fact that smart homes are all the rage these days. A fully funded Indiegogo campaign, the Xchime is more than just a video doorbell. It is going to be an essential part of your home safety environment, where you will be able to enjoy the added convenience and security features such as a garage door opener and smart light bulb integration. Security goes beyond that of the front door with the presence of Xchime in your home, which is expected to ship some time in August this year for its backers. After all, with garages being targeted by criminals as an easier entry point compared to the front door, it is imperative that more be done in that department. This is especially so as home owners tend to forget about the garage door, and with the Xchime in place, you can check out the status of your garage door instantly from your mobile device. You can opt to open or close it with a single touch via the mobile app, thanks to the optional garage door opener kit add-on accessory. Having a well lighted area is also another major deterrent against would-be thieves, and it is always a good idea to integrate smart light bulbs with Xchime in order to remotely turn on or off exterior lights. Another thing that the Xchime does well is the elimination of lag time — something that other video doorbells tend to suffer from. Having a 7 to 8 second delay is no fun at all, especially when someone you know and love is waiting in front. While the Xchime does not exactly offer real-time video playback, it is as close to real-time as possible. 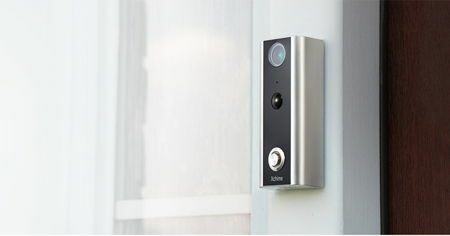 Early backers of the Xchime will be pleased to know that their device will retail for a mere $129 apiece, which is a whole lot more affordable than the $199 to $249 price point of other leading video doorbells in the industry. Any takers for this Full HD video doorbell?